Rahul Dev Burman, the Maestro Music Composer, needs no introduction to music lovers. Pancham has enthralled us for decades now, with his varied range of compositions from the purely classical to the foot tapping rhythmic western pop, which were well ahead of his time. ”RELIVE PANCHAM” is a purely Instrumental Musical Concert, featuring the finest of the compositions of Pancham, performed by none other than the Original Musicians from his own Troupe, LIVE for the first time in Singapore. Manohari Singh, Kancha Bhai, Suraj Sathe, Shyaam Raj, Kishore Sodha, Nitin Shankar and other veterans who were with Pancham all through his scintillating career will perform LIVE for the FIRST TIME in Singapore. The concert is on 3rd Aug and tickets can be purchased at the Sistic website or at their outlets. I saw the movie " Bucket List", a few weeks ago. Its one of those "feel good" movies about two terminally ill men ( Jack Nicholson & Morgan Freeman) who head off on a road trip with a wish list of to-dos before they die. "Kopi is the Indonesian word for coffee, and luwak is a local name of the Asian Palm Civet. The raw, red coffee berries are part of its normal diet, along with insects, small mammals, small reptiles, eggs and nestlings of birds, and other fruit. The inner bean of the berry is not digested, but it has been proposed that enzymes in the stomach of the civet add to the coffee's flavor by breaking down the proteins that give coffee its bitter taste. The beans are eliminated (defecated) still covered in some inner layers of the berry. The beans are washed, and given only a light roast so as to not destroy the complex flavors that develop through the process"
Holy cow ! That is exotic for sure. Sanjay Subrahmanyam, the famous carnatic music vocalist, blogs now. Sanjay used to earlier run the popular website " sangeetham.com". Now he has taken another web avatar with this blog. I love his sense of humor and candor ( Particularly listen to the audio posts).Its very interesting listening to the tidbits and anecdotes that are being shared in his blog on eminent personalities. Its also a great forum for rasikas like me to learn more on carnatic music and its intricacies from the horse's mouth. Sanjay, keep them coming ! I shot this photo of Angkor wat at the night time. 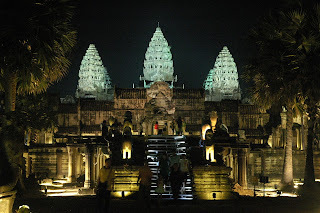 The Cambodian Government has introduced " special lights" night viewing and the temples look stunning in the changing light colors.